Here is my second attempt at marquetry, and once again the same subject, the geologic feature called Shiprock. The recipient for this picture is a great guy named Scott and will be a birthday present for him in a few days. I used a panel of 1/4 inch plywood as substrate. The eagle is made of mystery wood—I obtained a pack of assorted veneers and selected a piece of white and a piece of black/brown veneer. The sky in this desert seen is made from bird’s eye maple. The ground is made from pommele sapele veneer. 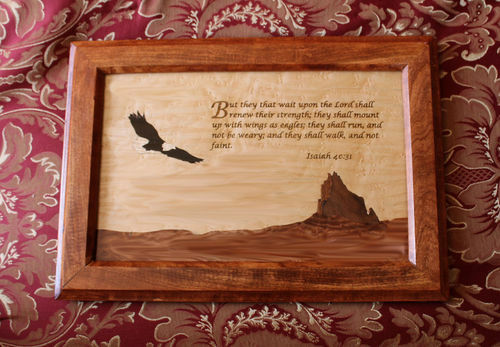 Shiprock, the mountain peak, is made from walnut burl and curly mahogany. The frame is made from cherry. I used blonde shellac, French polish application for finishing the marquetry panel. The frame has a top coat of sprayed laquer. The Bible verse was laser etched. I obtained the services of a company that inscribes trophies and plaques and similar items. Are you interested in a little geography? 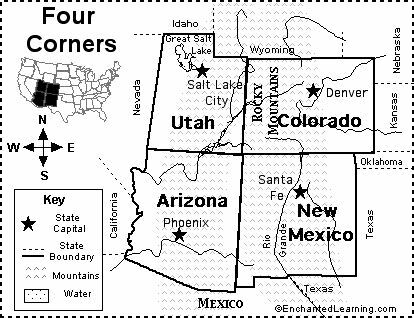 I live in the northwest corner of New Mexico. My house is located on a 300 acre hay farm, we also raise beef cattle. The northern boundary of our farm is defined by the San Juan River. On the opposite side of the river is the Navajo Reservation. As I stand in my front yard and look to the west I can see Shiprock, the main feature of this marquetry panel. It is very dry here, it is called the high desert. We average 6-8 inches of rainfall a year, making this one of the dryest continuously inhabited places on earth. Nonetheless, 90% of the water in the entire state of New Mexico flows through this county and there is an abundance of green fields and trees courtesy of irrigation. Bald eagles make their winter home in the cottonwood trees on our farm land. When the weather gets warmer the eagles fly away. Nice work!!! To me the mountains even look like hands. Great choice of woods for each element. Wohali is Cherokee for Eagle and that is one of my daughters middle names. Her Grandfather was part Cherokee and loved eagles very much. He passed before she was born so this is how we shared him with her. Thanks for sharing this talent with us. Very nice choice of veneers Grace. It looks like you are a natural at marquetry. Keep at it and keep showing us your results. A beautiful project with a story. Super! beautiful work and a wonderful view from your front yard every day.